Deep Purple and Led Zeppelin!!! Many years have passed since the last UK gigs from the classic line-ups of both bands. Whether you were lucky enough to have seen the originals live or not, Purple Zeppelin will take you back to the magic, the excitement and the sheer raw energy generated by those incredible musicians. THE BEST BITS, ALL OF THE TIME! 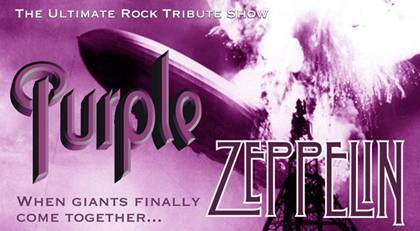 Purple Zeppelin are four talented and versatile musicians with decades of playing between them, comprising thousands of gigs and sessions both in the UK and overseas, selling out venues up and down the country. However, this is much more than just a great band performing all the 'Greatest Hits' - it’s a theatrical insight into these two giants of rock, complete with special effects, onstage 'artistic differences' and audience participation! The band are genuine admirers of both Deep Purple and Led Zeppelin and with the accent firmly on entertainment this is a night not to be missed, complete with Ritchie Blackmore’s on stage antics, Jimmy Page’s twin neck Guitar and Theremin, and a very special Violin Bow Solo! Come and experience the excitement of Deep Purple and Led Zeppelin in one mesmerising show!